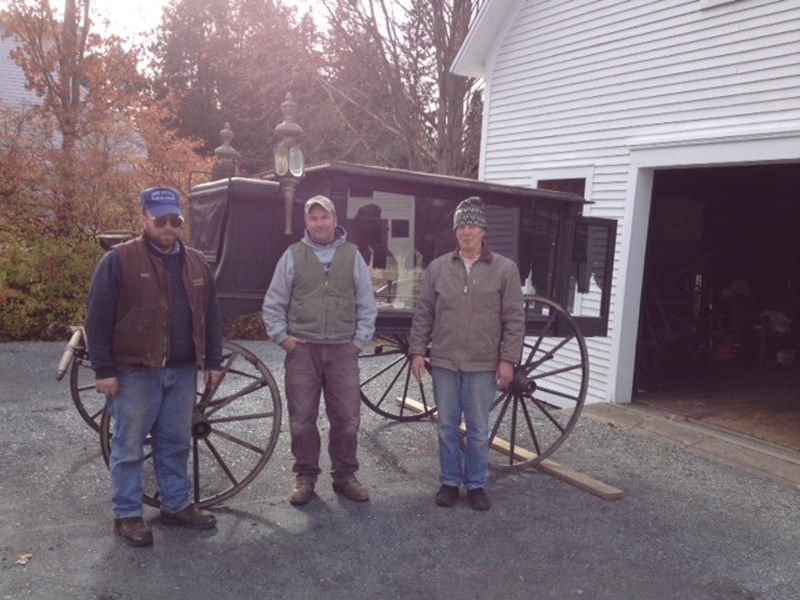 On November 8, 2014, the Norwich Historical Society was the recipient of a wonderful and unusual gift from the Norwich Cemetery Commission: the town’s 100+ year old horse-drawn hearse that has been housed at Fairview Cemetery since its “retirement” sometime during the 1930s. 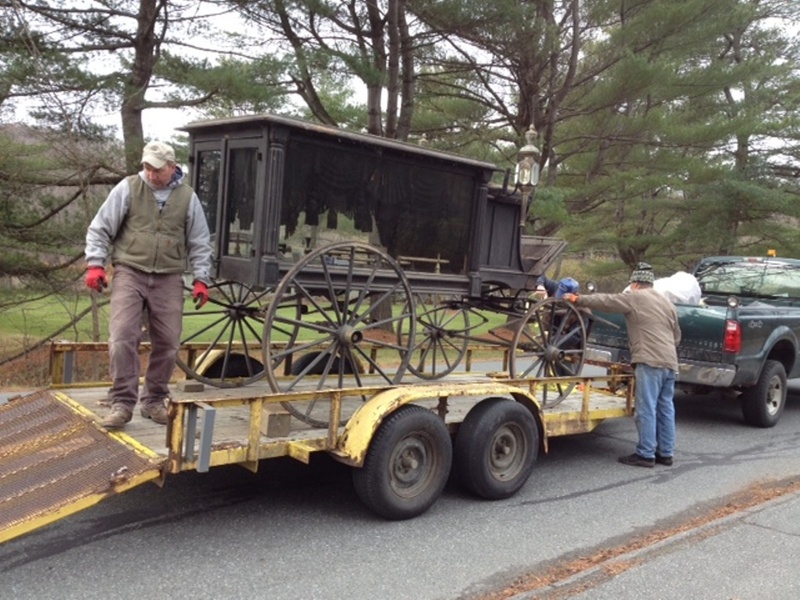 The hearse was transported to the Norwich Historical Society by Fred Smith, Jr., Chair of the Norwich Cemetery Commission, with the help of John Smith and Roger Blake. After a thorough vacuuming by Roger, it was rolled into the Society’s barn where it will await an assessment by a conservator to determine the scope and cost for its refurbishment. The hearse was accompanied by two sled runners, a one- and two-horse tongue, plus the harnesses for two horses. Two kerosene lanterns that sit beside the driver’s seat removed so it could fit into the barn. 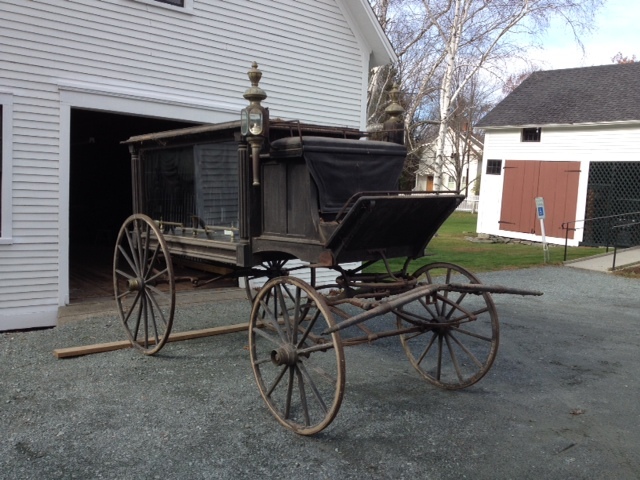 The hearse was purchased by the Town of Norwich in 1901 from George L. Brownell for $500. Charles F. Lewis (former resident of the Lewis House) was the driver and was paid $30 for his yearly services. It is believed the hearse was once stored at the Lewis property in the same barn as it now resides! Other drivers over time listed in the town reports were Charles Loveland, William N. Crandall, and George Aiken (1918). The hearse was once an exhibit in the Norwich Fair Parade in the late 1940s or early 1950s, but soon it was requested NOT be in the parade because of sentimental feelings of families whose loved ones were once delivered to their final resting places in the vehicle. It is believed the hearse itself was put to rest around 1935 when Rand & Sons – a Hanover firm who took over the funeral business – is listed in the town report. In 1994, the hearse was partially restored by a team of volunteers directed by then-curator Kimberly King Zea. Over the years, some deterioration has occurred mainly to fabric material on the roof caused by animals. Overall, the hearse remains in good condition and we hope have it restored to excellent conditions in the months ahead. 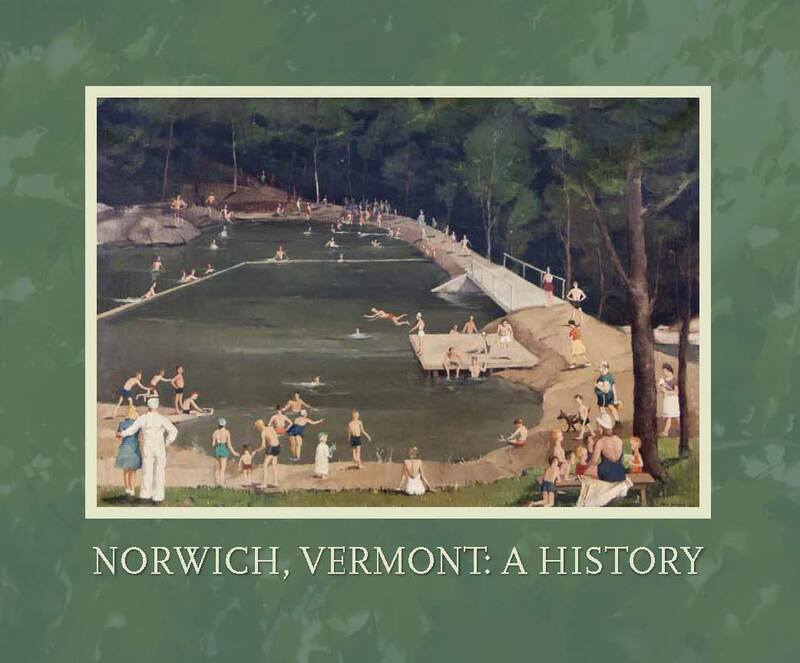 We thank the Norwich Cemetery Commission for its generous donation and for their stewardship of this wonderful historic artifact over the years. We hope you will come and take a look!